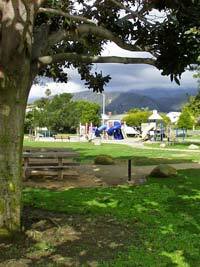 One of Carpinteria’s premiere park locations is Monte Vista Park with spectacular views of the Santa Ynez Mountains. The park is approximately 4 acres and features a childrens’ play area, passive recreation area, three barbecue sites, and a restroom facility. The park is located at the north end of Bailard Avenue adjacent to Villa Del Mar and Casitas Village condominiums. Barbecue sites may be reserved for a $35 reservation fee and a refundable $100 cleaning deposit. Inflatable jumpers must be permitted at a cost of $10 permit fee. Party rental companies must meet City insurance and business license requirements. For information on how to reserve a barbecue site please click City Parks BBQ Reservation form. A smaller neighborhood park, Carpinteria Creek Park is approximately 1 acre and is located along the Carpinteria Creek adjacent to a bike path. Access to the park is off Bailard Avenue turning west on Via Real. The park features two natural climbing structures, five picnic tables, a passive recreation turf area, and a beautiful sculpture of steelhead trout with interpretive signage about the endangered species. There are no barbecue facilities or restrooms at this location. Located adjacent to the Carpinteria Bluffs Nature Preserve and Coastal Vista Trail, Viola Fields consist of approximately 5.6 acres of active turf area designed to be used for baseball, softball, and other activities. The ballpark has a magnificent view of the Pacific Ocean and Channel Islands. Amenities include restrooms to be shared by field users and hikers alike. This property was originally acquired by the Citizens for the Carpinteria Bluffs and the Land Trust for Santa Barbara County in 2000. The Land Trust in turn gave it to the City of Carpinteria as open space to be held in perpetuity. Within the Boundaries of the Carpinteria Bluffs Nature Preserve visitors will find the Lois Sidenberg Coastal Overlook and a meandering section of the Carpinteria Coastal Vista Trail. Park at the Viola Fields or in the Nature Preserve parking area at Bailard Avenue. Whale watching, ocean views and birding are very popular activities here. Restrooms are located at the Lois Sidenberg Overlook. This park is dedicated to those who served our nation. Memorial Park is located north of the 101 Freeway on the corner of Santa Ynez and Aragon Streets. This neighborhood park is great for young children and offers a nice playground, two barbecue sites and a large turf area. Barbecue sites may be reserved for a $35 reservation fee and a refundable $100 cleaning deposit. Inflatable jumpers must be permitted at a cost of $10 permit fee. Party rental companies must meet City insurance and business license requirements. For information on how to reserve a barbecue site please click City Parks BBQ Reservation form. The Carpinteria Salt Marsh, also known as El Estero, is a rare salt wetland in Southern California. Nearly destroyed by development, the remaining estuary was restored in the late 1990s by a group of concerned citizens along with the City of Carpinteria, UCSB and the Land Trust for Santa Barbara County. Once completed in 1997, the eight acre portion of the marsh owned by the City of Carpinteria was renamed the Carpinteria Salt Marsh Nature Park. The park includes walking trails and interpretive signage that provides for casual self-guided tours of the reserve. If preferred, docent led tours are held at 10 a.m. every Saturday year round free of charge. Tours meet at the park main entrance and sign. To schedule a private tour, please email Carp_Parks@yahoo.com . The Carpinteria Salt Marsh is home to hundreds of migrating birds and other wildlife. Due to the sensitivity of the habitat, dogs and bicycle riding are prohibited here. Appropriately named for its historical tar seeps, Tar Pits Park is another location with breathtaking bluff top views of the Santa Barbara Channel and the Channel Islands Marine Sanctuary. This park provides hiking and biking trails and a few benches, but no other park amenities. Access to the park is very remote and it is suggested that you enter from the State Beach campgrounds or beach area (going south east walk along the beach and climb up the stairs). Continue to follow the trails further east of the park and you will find the Carpinteria Harbor Seal Rookery. Located between Eucalyptus Lane and Chaparral Drive, Heath Ranch Park is one of the City of Carpinteria’s Historical Landmarks. Within the boundaries of the park is the ruins of an old adobe home built sometime in the mid 1850’s. This ruin marks the site of the home of Russell Heath who built a elegant home here and once had what was thought to be the most desirable piece of agricultural land in the State. Heath served as County Sheriff, District Attorney, as a State legislatuor and farmed over 100 acres of walnuts, lemon, oranges and other valuable crops in Carpinteria. The Ruins that include a concrete statue and the very large eucalyptus trees are now a reminder of the past in a very pleasant neighborhood park. Located on El Carro Lane (5300 El Carro Lane) between Casitas Pass Road and Linden Avenue is El Carro Park. 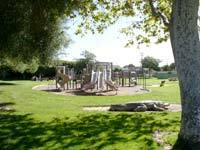 This large neighborhood park can also be accessed from the north on Foothill Road (5305 Foothill Road) and is directly adjacent to Girls Inc. The park offers two large turf areas. The area on the south consists of two baseball ball fields. The north portion is a soccer field. Other Park amenities include a children’s playground, two restroom buildings, and three barbecue sites. Barbecue sites may be reserved for a $35 reservation fee and a refundable $100 cleaning deposit. Inflatable jumpers must be permitted at a cost of $10 permit fee. Party rental companies must meet City insurance and business license requirements. For information on how to reserve a barbecue site please click City Parks BBQ Reservation form. A small pocket park, Franklin Creek Park is located along the Creek on Sterling Avenue. 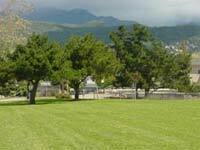 The park has an old fashioned swing set and a long turf area great for relaxing. This is the newest of City park destinations. Located in the downtown beach area at 390 Linden Avenue. 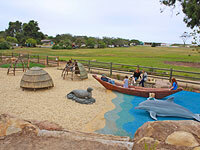 The area is the result of a partnership among the Carpinteria Morning Rotary Club, the California Department of Parks and recreation and the City of Carpinteria.